Wouldn’t it be nice if you can carry around a good camera and a good mobile phone anywhere, without having to lug aroung big pieces? Well, Samsung has answered your prayers. The i850, aptly called Innov8, takes mobile handset photography and multimedia experience to new heights. Tech-savvy users will surely love the Innov8′s 8-megapixel camera, pre embedded 3D games, high-speed data connections, 8GB or 16GB internal memory. Mobile browsing comes easy with its optical touchpad and four-way navigation key that allow users to enjoy a PC-like experience. And if you find yourself lost while navigating through tourist spots, the Innov8 is equipped with a GPS technology, offering NavFone navigation and geo-tagging service. Featuring full HD and 1080i mode with a 30 frame-per-second recording capability, the HMX20C’s flash-based design makes this camcorder compact and easy-to-use. With an integrated docking station, users will find it simple to not only charge the HMX20C, but utilize the HDMI input and component connectivity to easily view home movies directly on an HDTV. 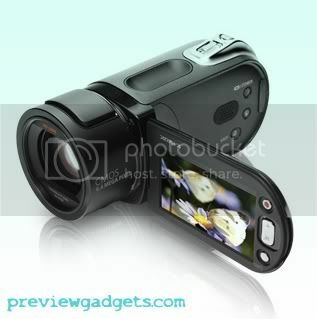 You can even connect the camcorder to a laptop or pc via a USB connection and share home movies with family and friends quickly and easily. This camcorder features a 6.4-megapixel CMOS camera with electronic image stabilization so that even action-packed scenes come through with clarity. Featuring an HDMI-CEC (Anynet +) high-quality connection to HDTV’s and other devices, consumers can easily control the camcorder through their Samsung HDTV remote while viewing movies. For sport fanatics, the HMX20C features a high-speed capture and super slow motion playback, perfect for analyzing their golf-swing in slow motion, or anyone interested in getting the detail of fast-flying events. At only 10.9 ounces, the HMX20C fits easily into the palm for quick -and-easy shooting. It’s stylish too, as the design utilizes trends seen in the fashion and car industries, resulting in a camcorder that’s as elegant as it is practical. At exhibition CHITEC 2008 South-Korean company Samsung has shown the wide public phone of model F268. It is stylish slider in the brilliant metal case, able to work in networks GSM of 900/1800/1900 MHz and supports WAP 2.0. The information is deduced on the 2,1-inch display with the sanction 240х320 points and support of 262144 colors. F268 it is equipped 2-Mpx camera with a digital zoom and an opportunity of record of video. In it there is the preestablished player supporting formats MP3/MPEG4/3GP/AAC/WMA, and also the FM-receiver and slot for cards of memory of the standard microSD. At present the date started of sales and a retail price of this phone are unknown. Most likely, it will be on sale only in territory of Korea. Samsung announced new LCD monitors line with the ’53 Series’. This line is between desktop and TV stand, and high 8,000:1 contrast ratio. Response is 2ms for gray-to-gray, and they support HDCP encryption.